Giveaway: Layered Rainbow Tutu Skirts with Unicorn Horn Headband Outfits… | FreebieOrBust Freebies! Get ready for another chance to win big with our giveaway deals! The more time you waste pondering your decision, the less time there is to get lucky on your first sweepstakes entry! 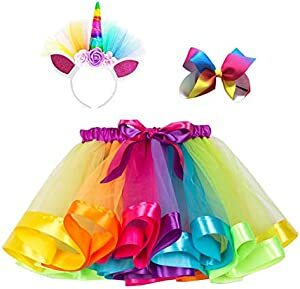 Layered Rainbow Tutu Skirts with Unicorn Horn Headband Outfits for Little Girls – Unicorn Costumes (Colorful, L(4-8) Years). Your chance are 1:800. There are a total of 2 prizes available. Offer hosted by Amazon and Rainbow Skirt for Girls.